Mixing up sizes, patterns and even colors can be fun, eclectic and cool! Why limit a glass block layout to stacking one block on top of another? 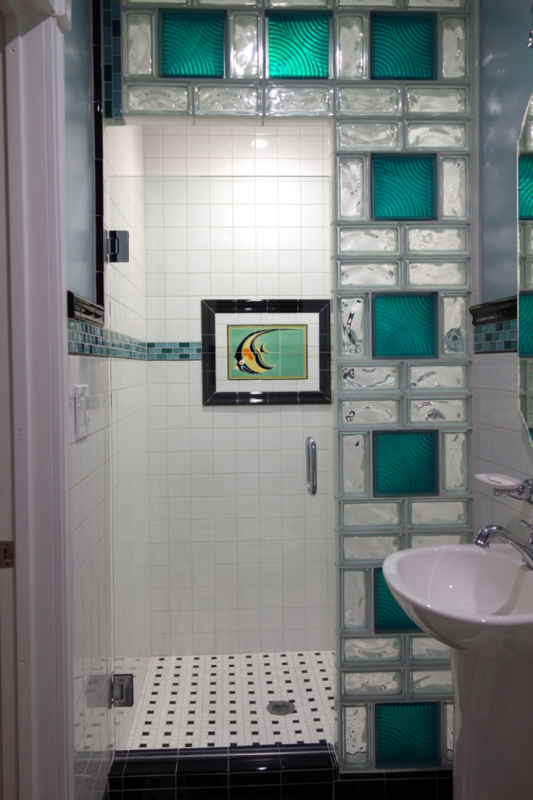 In this project 4″ x 8″ in a clear wavy pattern where combined with colored blocks in a teal 8″ x 8″ size. Its also interesting how the blocks over the doorway seem to ‘float in space.’ The color of the glass was chosen to match with the Catalina tile you’ll see on the inside wall of the shower. This is certainly not a ‘generic’ shower. 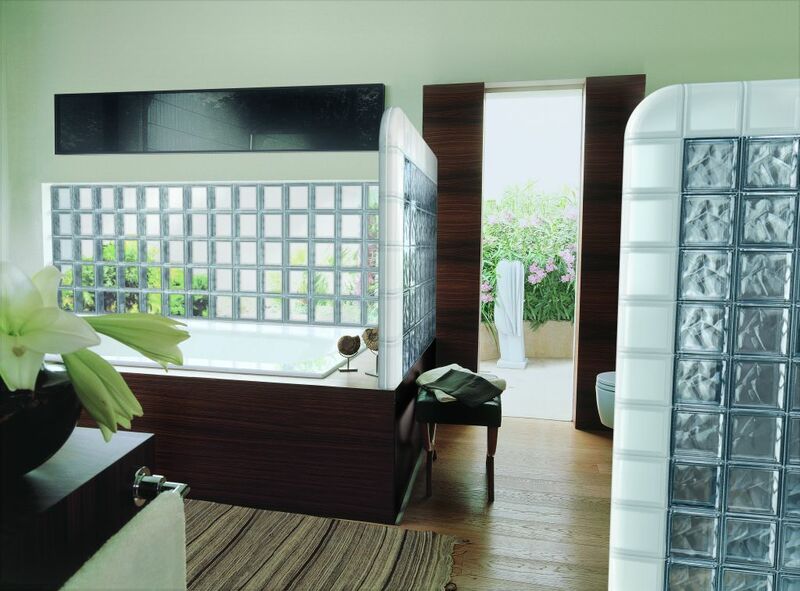 Adding texture and depth to a design can provide more interest for a shower wall, bathroom window, kitchen backsplash or partition wall. Newly introduced textured mosaic and pyramid shaped blocks (which literally pop out of a wall) can make a unique statement. This is the same type of unit you’ll see in an eclectic boutique chic hotel like “The W” – don’t you think? 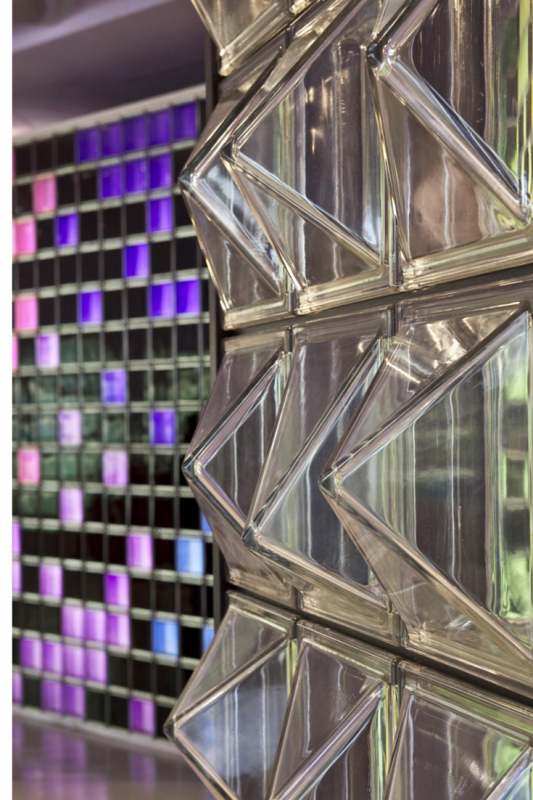 These pyramid glass blocks not only move light between interior (or exterior) spaces – they also DEMAND attention! Design Idea 3 with glass blocks– Frosting is not just for cakes! 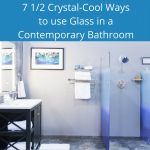 While frosting is sweet on a cake, a frosted surface on a glass block wall or window can add subtle sophistication, bring light through and make your bathroom or bedroom private. 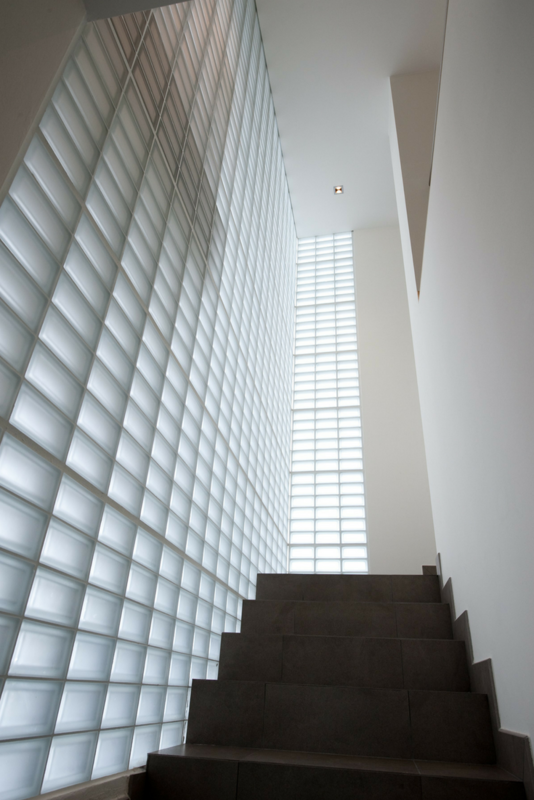 In the projects below frosted glass blocks add privacy, yet move light through this stairwell in a bathroom separation wall. If you’re a fan of Piet Mondrian (considered by many the father of modern art) you’re going to love this idea. Using colored glass blocks in the Mondrian color palette and a black grout joint (to mimic a caming effect) transformed this room with fun colored lights and a modernistic design look. Non-patterned (see-through) glass blocks provide a cleaner look than the obscure type patterns often associated with glass blocks. 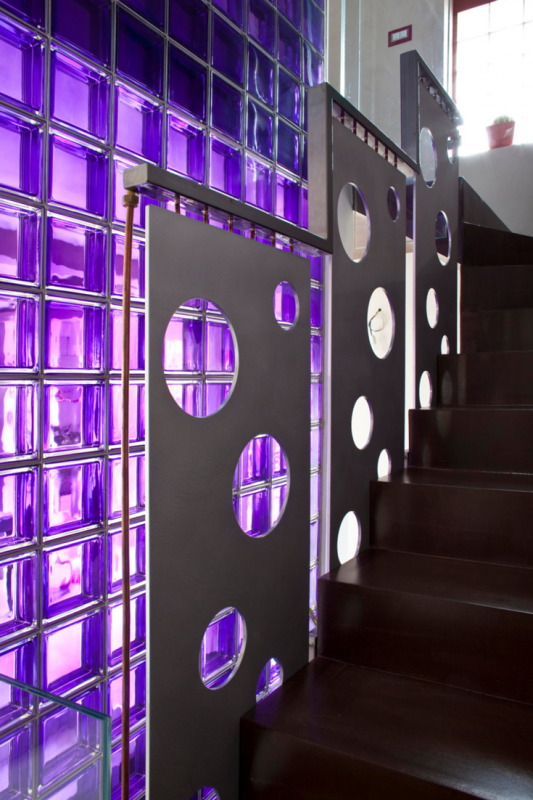 This modernistic installation in a purple color has a WOW affect. 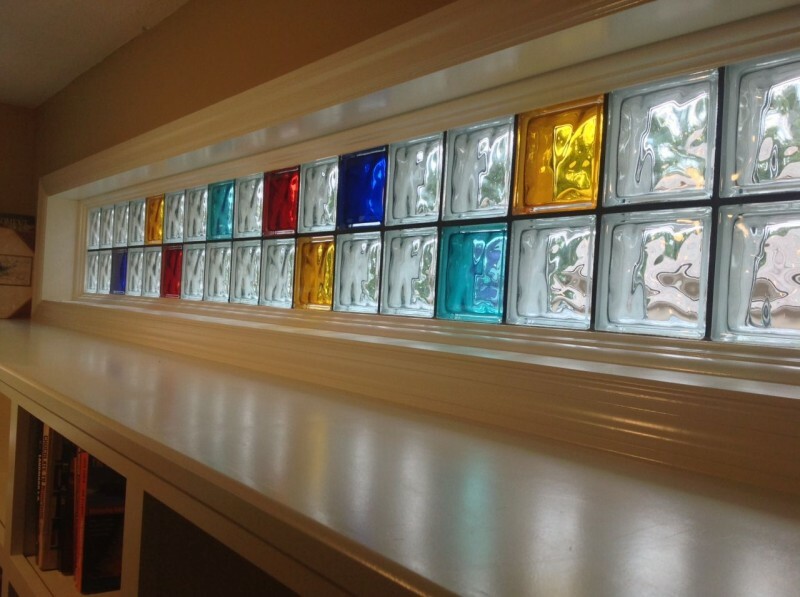 Has any of these 5 designs changed your opinion about using glass blocks in your home or business? Did we inspire you, or do you still the material as a wacky idea? I’d love to hear your thoughts below. Call Innovate Building Solutions for direct product supply on a nationwide basis (877-668-5888). For a local project their divisions including Columbus Glass Block (614-252-5888), Cleveland Glass Block (216-531-6363), West Side Glass Block (216-398-1020) or Mid America Glass Block in Akron (330-633-2900). Jo – we can help you by shipping our Protect All Glass Block window system (either framed or unframed) direct to you in South Carolina. We can then assist your local contractor with their installation questions. Feel free to call us at 877-668-5888 so we can answer any other questions you have. 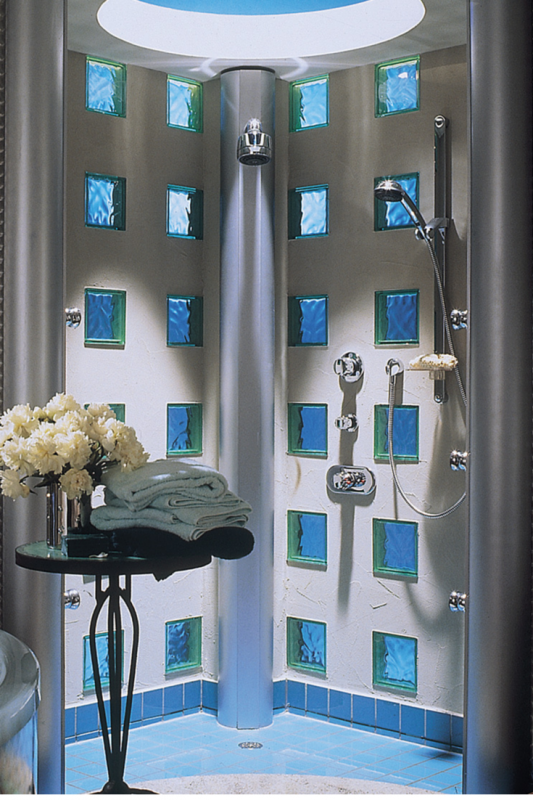 We live in the Hilton Head, SC area and are very much wanting to use glass blocks to replace a window above the tub. Do you have anyone in this area?